Brain Boosters music enters your students' ears, engages their brains, and relaxes their bodies. When you play this beautiful instrumental background music, you promote the state of flow in your classroom as your students read, write, study, work on projects, and solve problems. 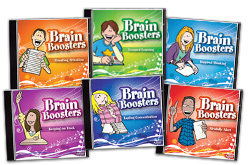 Brain Boosters music is composed at the ideal tempo so students pay attention and keep on track. Promote a harmonious class climate. Enhance your students' performance and productivity with this brain-friendly music that helps students enter a state of relaxed alertness. Regular price $90. All 6 CD set CGBB • $69 Save $21! Save on the Music Sampler Set! Compelling brain research concludes music has the power to reduce stress, enhance cognitive functioning, and improve productivity and creativity. The human brain is an amazing instrument that can be tuned to perform optimally with the right kind of music. Music for the Mind™ is a collection of beautifully-orchestrated compositions that resonate with listeners of all levels, enhancing mental performance. Ask Kagan about royalty free music rights for special projects and presentations. Regular price $90. All 6 CD set CGM • $69 Save $21! Royalty free music rights available for special projects and presentations. Click Here for more info. Teach character through music! Music touches our hearts and our souls. And now, you can use music to help your students develop positive character traits that will serve them for life. Your students will enjoy singing these whimsical lyrics set to well-known children's tunes. Students sing to learn about citizenship, compassion, cooperation, courage, friendship, honesty, perseverance, pride, respect, and wisdom. Each set includes a CD and a reproducible lyrics packet.